This product can be used for edging around lawns, in driveways, walkways, curbs, along fences and foundations, near trees and shrubs, in flower beds, mulch beds and other similar areas of the yard to get rid of undesirable vegetation. Hold eye open and rinse slowly and gently with water for 15-20 minutes. Remove contact lenses, if present, after the first 5 minutes, then continue rinsing eye. Call a Poison Control Center or doctor for treatment advice. Take off contaminated clothing. Rinse skin with plenty of water for 15-20 minutes. Call a Poison Control Center or doctor for treatment advice. Have the product container with you when calling a Poison Control Center or doctor, or going for treatment. CAUTION. Causes moderate eye irritation. Avoid contact with eyes or clothing. Wear long-sleeved shirt, long pants, shoes and socks. Wash thoroughly with soap and water after handling. Contents under pressure. Do not use or store near heat or open flame. Exposure to temperatures above 130°F may cause bursting. This pesticide is toxic to aquatic invertebrates. Do not apply directly to water. Do not contaminate water when disposing of equipment washwaters. Clothing and protective equipment exposed to this product should be washed in detergent and hot water. Such items should be kept and washed separately from other laundry. Users should wash hands before eating, drinking, chewing gum, using tobacco or using the toilet. Users should remove clothing immediately if pesticide gets inside, then wash thoroughly and put on clean clothing. Users should remove clothing and protective equipment immediately after handling this product. As soon as possible, wash thoroughly and change into clean clothing. STOP. Read entire label before use. It is a violation of Federal law to use this product in a manner inconsistent with its labeling. For outdoor residential use only. STOP Do not allow people or pets to touch treated plants until the sprays have dried. Do not apply this product in a way that will contact any person or pet, either directly or through drift. Only persons applying this product may be in the area during application. Do not mow, cut or otherwise disturb treated weeds or plants for at least seven days following application. Do not use on or around edible feed or food crops. 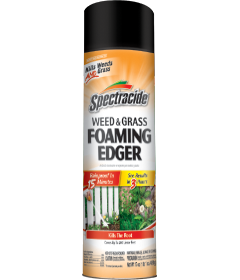 For best results, apply during warm, sunny weather (above 60ºF) when weeds are actively growing. Rainfall or watering 15 minutes after application will not wash away effectiveness. Completely cover the foliage of the target vegetation. Do not overspray. Sprayed plants begin yellowing and wilting in hours, with complete kill, including the roots, in one to two weeks. Protect desirable plants with a piece of plastic or cardboard. If desirable plants are accidentally sprayed, wash plants with water immediately. Not recommended for spot weed treatment in established lawns since lawn grasses will also be killed. Pesticide Storage: Store in a cool, dry area away from heat or open flame. Do not puncture or incinerate! Pesticide Disposal: If empty: Place in trash or offer for recycling if available. If partially filled: Call your local solid waste agency for disposal instructions. To the extent required by applicable law, buyer assumes all responsibility for safety and use not in accordance with directions.